Although there are no official statistics, home remodeling is probably up there among the top 10 of stressful situations. Use these tips to help you get through the process, and then delight in the results of your renovations. And, remember that your home improvements increase the value of your property. Get organized before the remodeling begins, and move essential and valuable items out of the area that is being worked on. For example, if you're cabinet refacing in your kitchen, your cooking and dishwashing areas are going to be unusable for a time. 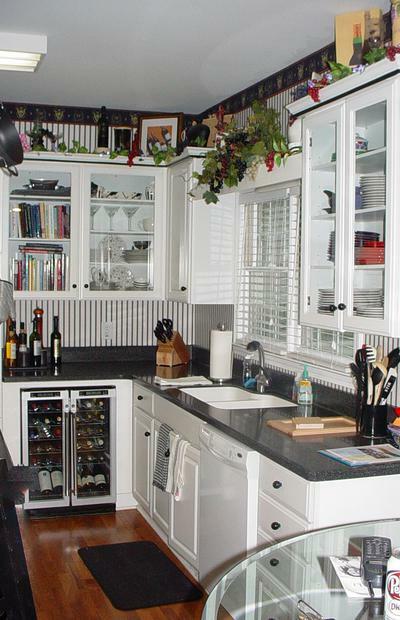 Move the microwave and refrigerator into another room or the garage so they're easily accessible. Borrow or buy a portable hotplate or a camping stove, and make good use of your barbecue grill if the weather is fine. Make sure you move all your utensils, crockery and cookware out of the kitchen. Protect your floors, whether they are tiles, hardwood or carpets. Cover them with heavy-duty plastic sheets or canvas tarpaulins; your building contractor may have some you can use. Kids and pets are often extremely curious about building work going on in their homes, but exploring busy sites can be dangerous. Set down rules for children, making sure they know to stay out of construction areas. Either restrict access of pets to these spots or relocate them to a friend's home for the duration. Many remodeling projects involve copious amounts of dust. Shut as many internal doors as possible to seal off rooms that are not undergoing renovations, and ignore the rest of the house. It's pointless trying to keep your home totally clean when it's being refashioned, and you'll add to your stress levels if you attempt it. Any project manager will tell you that a key part of successful endeavors is for team members to effectively communicate with each other. You and your contractor are on the same side, and you need to regularly talk face-to-face or on Skype to resolve any problems and discuss the next steps of the renovations. Be sure to swap cell phone numbers so you can be contacted during the day when you're at work or out on errands. Remember the whole family is feeling the disruption of your home remodeling. Be kind to one another, make allowances for crabby behavior and take time out to have some fun. If you need advice on refacing kitchen cabinets in Georgia, contact Detail Design & Remodeling today.